489107 at Wirksworth Station on 17th April 2003. This unit is one of two preserved on the Ecclesbourne Valley Railway in Derbyshire. 489104 passing through Clapham Junction on 19th July 2003. This unit was used on Gatwick Express services from London Victoria-Gatwick Airport until withdrawal in 2005. 489108 at London Victoria on 18th March 2003. This unit carries the InterCity Gatwick Express livery. 489110 at London Victoria on 18th March 2003. This is was one of the final two units in service with Gatwick Express. 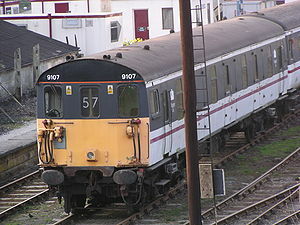 The British Rail Class 489 (or GLV) is a type of electrical multiple unit, specially converted for use on Gatwick Express trains, from London Victoria to Gatwick Airport. This page was last changed on 10 March 2013, at 09:02.